Properties in Villefranche-de-Rouergue average 4.8 out of 5 stars. Cottage the house in the alley. Property 2: Cottage the house in the alley. Old building, with private pool in the heart of a small farmhouse Quercy. Property 31: Old building, with private pool in the heart of a small farmhouse Quercy. 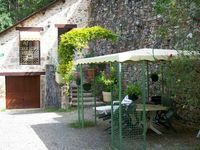 Gîte d'Ambre: DOMAINE DE SAUTOU: Superb cottage - Capacity 6 people. Property 36: Gîte d'Ambre: DOMAINE DE SAUTOU: Superb cottage - Capacity 6 people. We had a very nice stay. The owner was very helpful, everything was prepared when we arrived. Can easily host up to 4 people, located next to the church, has a parking spot. No more than 10 minutes walk away from the castle.